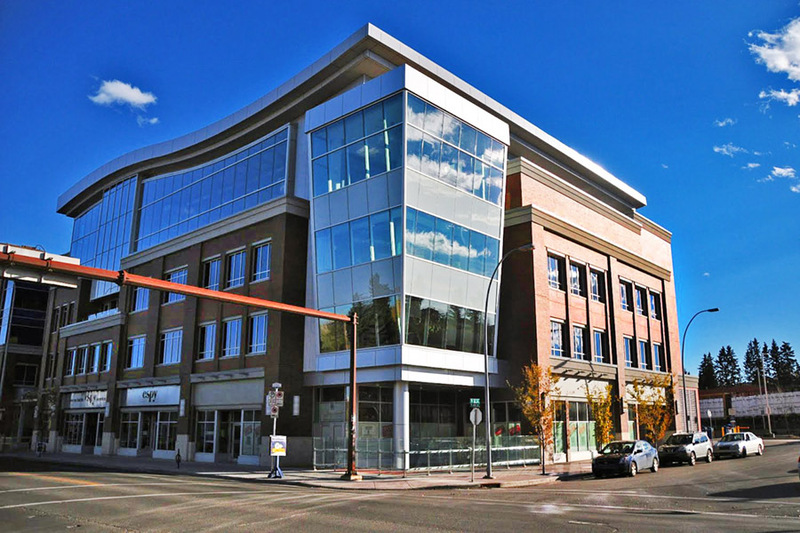 Located on the east edge of downtown Calgary, the Atlantic Avenue Art Block is a four-storey retail, office, and art gallery building with underground and surface parking. The new facility boasts a sleek, modern design with hints of inspiration from the community’s historical setting. The building has achieved LEED® Silver certification. The structure was built with cast-in-place concrete with slab-band construction to accommodate long span, high loading, and offset column alignment requirements. The top floor construction uses structural steel to showcase unique architectural features including a waved roof. A high water table and challenging soil conditions required innovative structural foundation solutions to satisfy geotechnical requirements as well as to maintain constructability. Williams Engineering Canada (WEC) provided structural, building envelope, roofing services for this project, as well as specialty structural engineering services for a four-storey central atrium stair sculpture. The atrium functions as the circulation stair for the building and provides direct access from the gallery’s main entrance on the fourth floor. Inspired by an artist, this feature was created using stainless steel and glass materials sourced from various locations around the world. Both the fabrication and the construction of the stair sculpture was facilitated using a three dimensional model and shop drawings. The design for the art gallery space required specific building envelope expertise to accommodate the building’s high humidity levels and the large window sections. The art gallery features a raised mezzanine and a floating ‘birds nest’ conference room, and a three dimensional model of the conference room was also created to facilitate the modification and installation of the steel ribboned nest structure. Our building science team provided quality assurance observations for the waterproofing beginning below grade in the parkade. During construction we monitored the entire building envelope at grade level to ensure continuity of the air vapour barrier in the walls and the door and window connections. Quality assurance observations were also provided during construction for the entire installation of the roof. WEC worked closely with the architect, Abugov Kaspar, to ensure the unique wave roof had proper stormwater drainage to prevent standing water. The Atlantic Art Avenue Block will be a refined and elegant addition to Calgary’s Inglewood community.